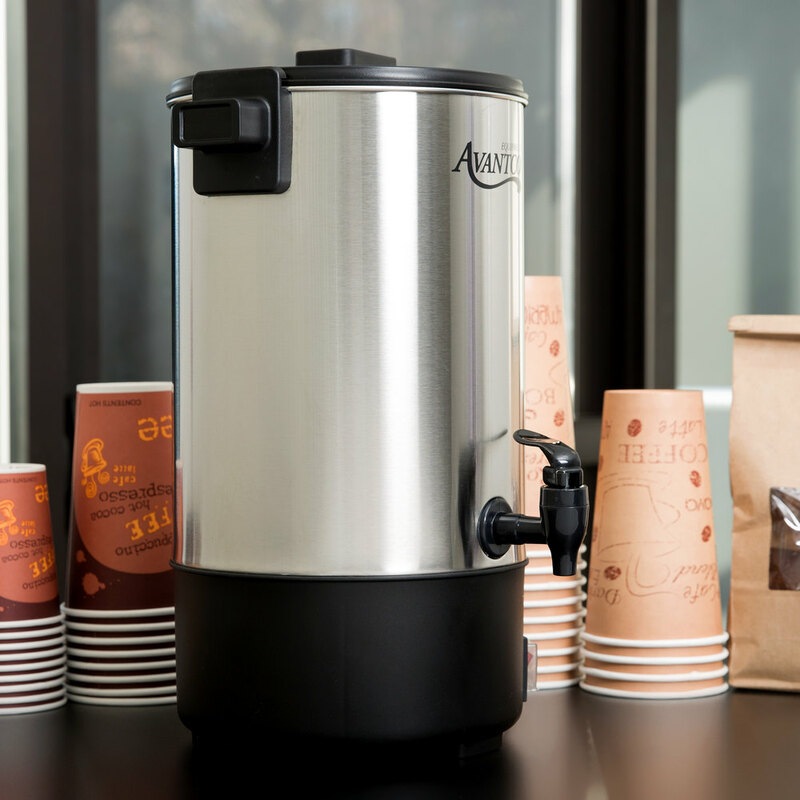 Designed to brew delicious, flavorful coffee day after day, the Avantco CU30 30 cup coffee machine urn is perfect for caterers, schools, churches, offices, and more! This durable coffee machine urn is easy to use, with a heating light to show when it's in brewing mode and a warming light to show that it is in warming/holding mode, which keeps coffee hot and fresh for hours. 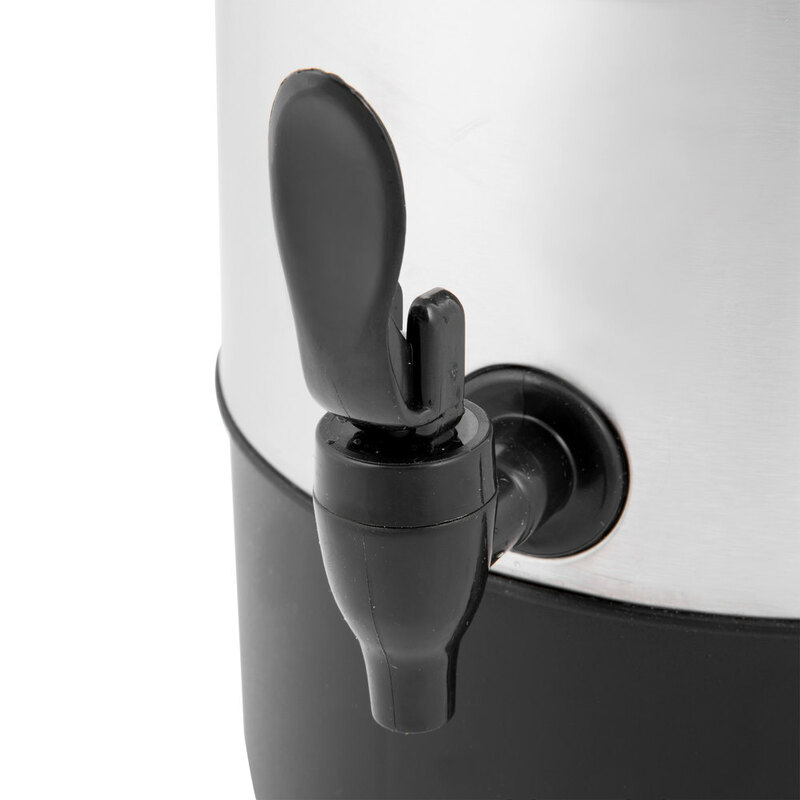 The waterproof switch is protected against unexpected spills and splashes and cool-touch plastic handles stay cool even while the urn itself is hot. 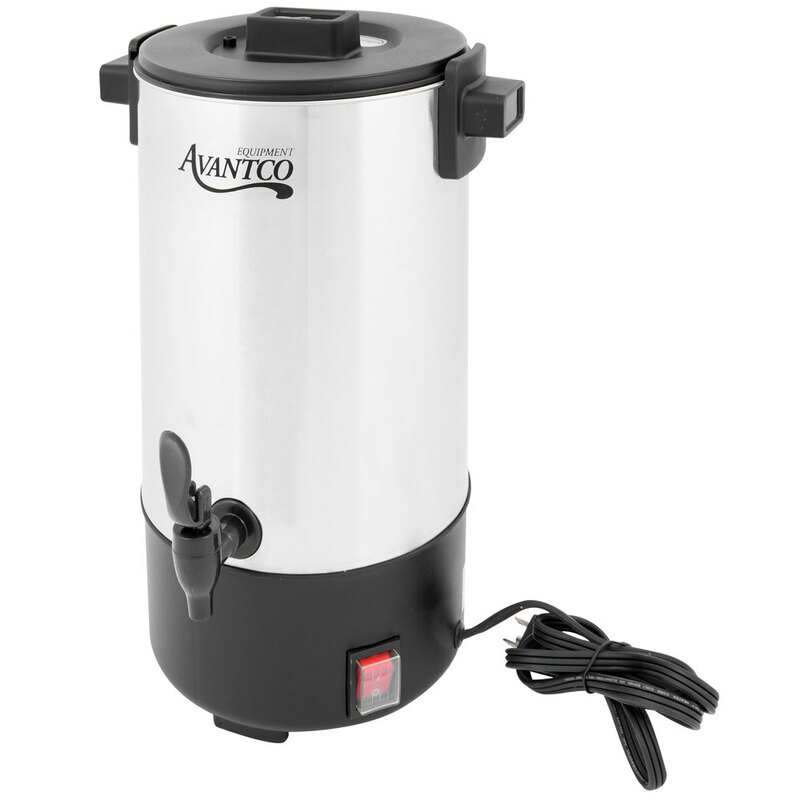 The Avantco CU30 coffee machine urn is made of sturdy stainless steel with boil dry protection to ensure safe, efficient operation. Temperature is controlled by an advanced built-in thermostat that keeps coffee at ideal serving temperatures at all times. Plus, the dripless dispensing faucet keeps your countertops clean and your floors safe and dry by eliminating leaks, and the locking lid ensures that coffee will not spill during transportation. This unit requires a 120V electrical connection. 950W. My family loves coffee so much that I perk a 30 cup urn every Saturday and Sunday when everyone is home. This urn perks hot, delicious coffee in no time! This thing heats up in a hurry! I love that fact. However, it makes the water hot--I mean HOT! If you have little ones around it, you has better be sure that they are using the spout as they could get seriously burned. We used this to keep hot water over the Jewish holidays when we were in a vacation home. Heats up quickly and was perfect for our needs. Very easy to use. 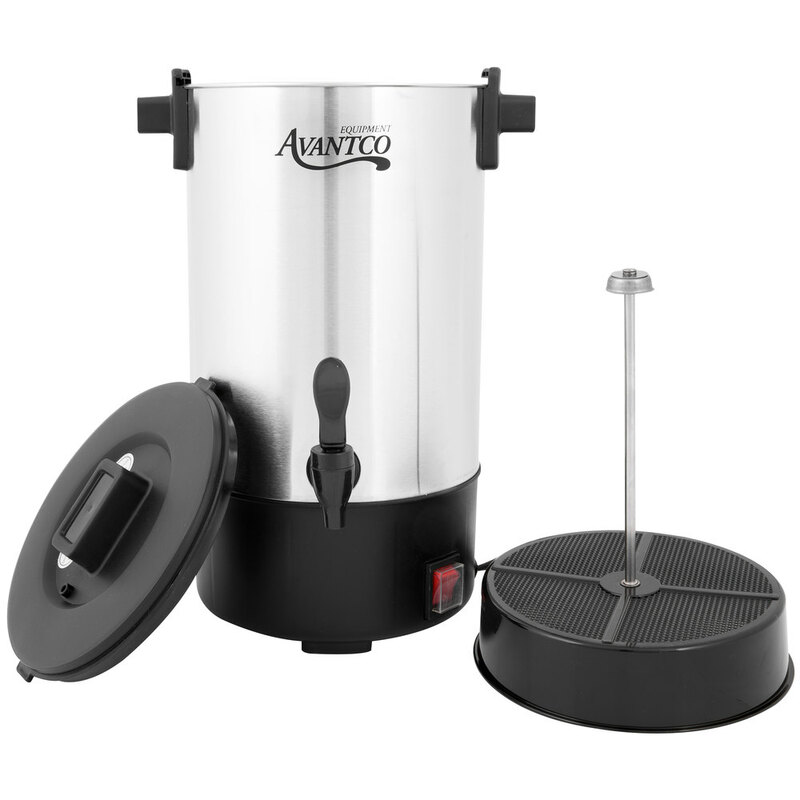 The small capacity, thirty cup stainless steel coffee urn from Avantco is a great quality and does an excellent job for warming and serving coffee at our office meetings. The urn is light weight and makes it easy to transport and handle. The price and size were what we needed. It is very fast to heat up and easy to clean up after. You could also use it to heat water up for tea. Great coffee urn, a really nice stainless steel finish. It brews really fast, I ended up making 20 cups in around 20 minutes. It hold heat really well, coffee was hot an hour after being unpluged. This would be a fantastic urn for a company office or a catering job, but it leaks at the handles! I was going to use it for catering but the leaks on the handles give the urn a tacky/cheap presentation, so now I just use it in my home. I surprised with quality this product have. I used it for both coffee and tea for our party up to 25 people and it covered all the need. Bought two of them and very happy with it specially it was free shipping! Our coffee makers get a great deal of use off premise. They transport very well and are very reliable. They are a very good value . Gets the job well done! the urn is easy to clean and operate. My only complain is that the bottom gets rusty really easy and you can't get ride of the rust. This 30cup Coffee Urn was larger than what I had imagined. I was about to order the next size up but so glad I didn't. We used this to just keep water warm for a Hot Chocolate bar we had during the holidays. It worked out wonderfully and was such a huge hit. Cheap and does exactly as advertised. We only use it to boil and hold hot water to make tea, and it does the job. Boil quickly and hold temp well. This 30 cup stainless steel coffee urn is great for hosting parties or starting your morning off right at work with your employees. I love the attractive stainless steel design! This is a decent stainless steal coffee urn for the price. Ideal for any restaurant or café looking for a large coffee urn. Easy to use and easy to clean. This stainless steel coffee urn is great for any restaurant, café or office. Holds 1.1 gallons of coffee and front dispensing lever is easy to use. Great little coffee urn for the price. Does exactly what it should, brew coffee and keep it hot. Haven't had any problems with it since we purchased it. This little urn is very useful. I use it more for hot water and mulled cider than coffee, but it can of course make coffee too. Fantastic unit, very happy with this purchase. It was easy to use and easy to clean...I am Fixing to order another unit to also brew decaf. 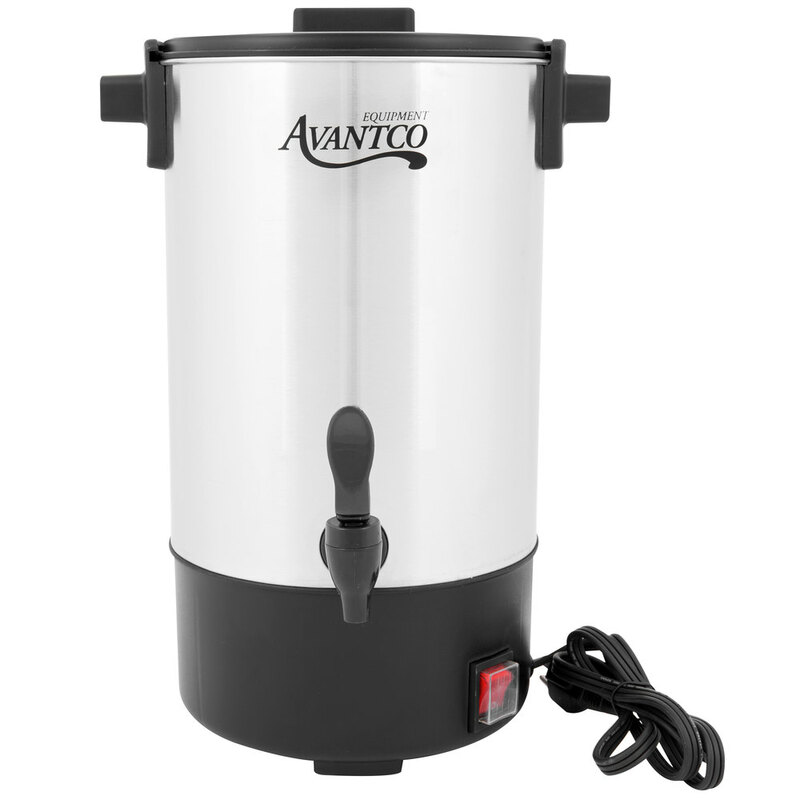 This is my second time purchasing the Avantco Coffee Urn. Our first one is being used for coffee. It's been very durable and works great. So decided to purchase another one for hot chocolate for different family events. This stainless steel urn, is reasonably priced, easy-to-use and easy cleanup. We received many compliments on the coffee. Recommend this small appliance with "5 stars"
I ordered this nice coffee urn. I have not used it yet since it is hot but I will be glad to use it when it cools off in Georgia. I used this coffee urn for my hot chocolate bar at my wedding. I decided to only have the water in it so that each person could pick how tasteful they wanted their hot chocolates. It heats up quickly and is an overall great product. This is an awesome product! The water heats up fast! This also has the ability to brew the coffee which we were unaware of when we bought it so that is a major plus. Definitely a great buy! Very useful for mobile setup during trade shows or store product demos. It is convenient to have the ability to boil water with one equipment without the need of a stove. This is a great product. It makes quite a bit. There's now no need to have to keep making pot after pot in an average size regular coffee machine. It was easy to use and created a hot and tasty product. The handle was easy to turn and sturdy too. There was no drips whatsoever. I bought the Avantco CU 30 for home use in March 2016. We used it three times a week to heat water quickly for brewing tea for ice tea. It lasted until February 2017. We loved it while it worked. As soon as they are back in stock, we will order another and hope it lasts longer. I bought these 2 urns for my wedding they are very sturdy because they were shipped from U.S.A to Barbados with no damages. Although they came with manuals didn't have to use because it was just so easy to use.